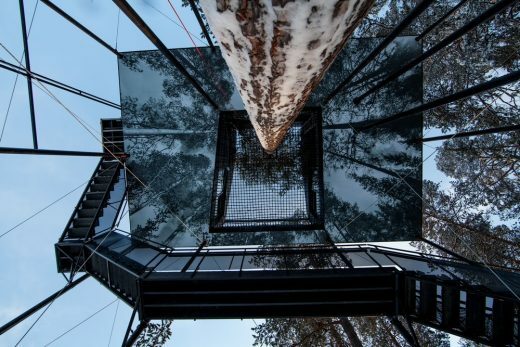 In the tall pine forest of Northern Sweden, where the tricolored tree trunks stretch up to the soaring crowns, a new addition to the renowned Treehotel has opened. 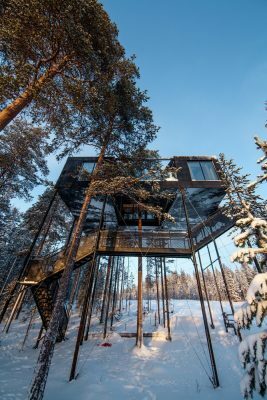 Hovering ten meters above the ground within the tree canopy, the Snøhetta-designed 7th room provides its guests with a breathtaking view of the Lapland treetops and the Lule River. 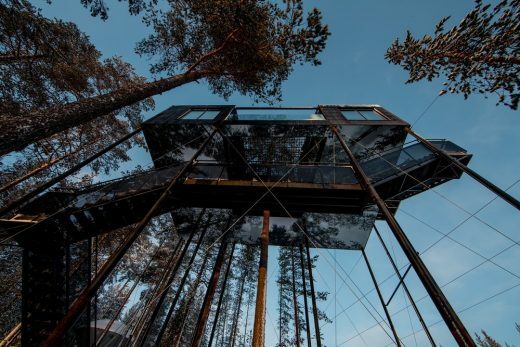 With focus on the surrounding nature, the design features large windows, a netted terrace suspended above the forest floor, and a tree stretching up through the cabin. 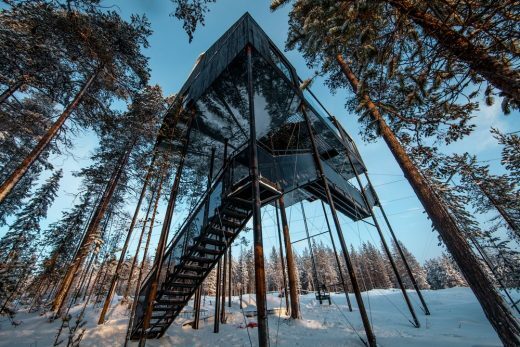 The boundaries between indoors and outdoors are blurred, making the cabin part of the forest. The 7th room experience begins when approaching the cabin from the forest. 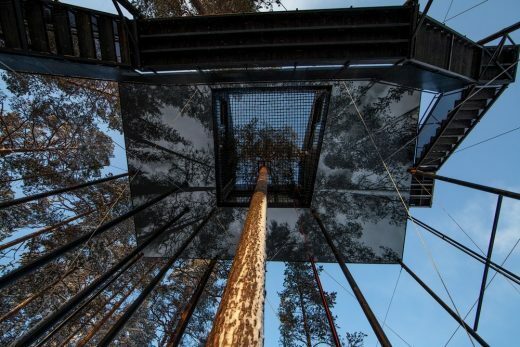 Nearing the base of the tree, the view of the complete cabin gradually recedes as a sixth façade appears. 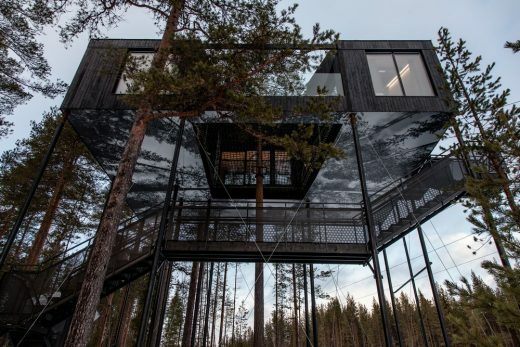 This façade is the bottom of the cabin, where a 12 x 8-meter surface is covered with a large black and white print of trees reaching up into the sky. A staircase brings guests from the ground and up into the cabin, along with a small lift for transporting luggage. 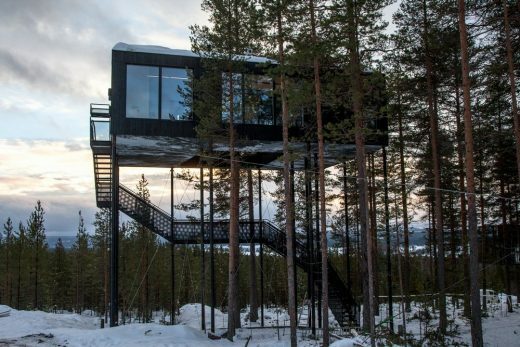 Twelve columns carry the cabin, reducing the load borne by the trees and its impact on the surrounding forest. This gives a feeling of height and weightlessness, as well as stability. Built as a traditional Nordic cabin, the wooden façade is clad with pine boards. The surface is burnt to create a dark and maintenance free façade. The indoor flooring is made from ash wood, while birch plywood is used for the interior walls. 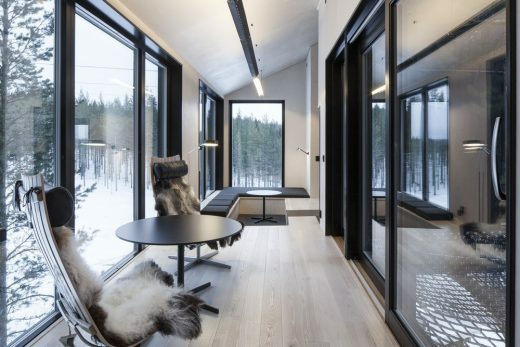 With complementing light, wooden furniture, the interior makes up a blonde Nordic contrast to the dark exterior. The 55-square meter space is designed to create a place for living. With two bedrooms, a social lounge area, bathroom, and the airy terrace, the cabin accommodates up to five guests. The varying floor heights creates an efficient and playful interior design. The space is laid out on two levels with only 30 cm difference in height. The lounge area is located on the lower floor, while the bedrooms are on the upper level with the beds embedded in the floor. The design of the 7th room aims to bring people and nature closer together, extending the cabin’s social spaces to the outside and further blending the distinction between indoor and outdoor. Entering the cabin, one arrives into the lounge area. 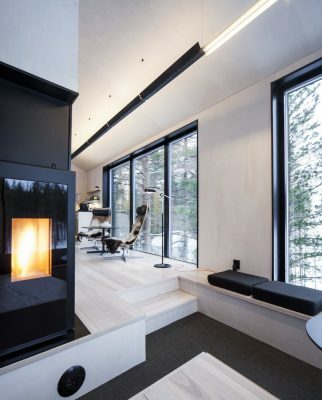 This is thought of as a social space, and it is furnished with a central pellet stove and simple, yet characteristic furniture such as Scandia Chair by Norwegian furniture designer Hans Brattrud. A north-facing floor-to-ceiling window gives you the best chance to see the Aurora Borealis on a clear day, giving this social space the name the Northern Light lounge. A large glass door leads from the lounge area out on the netted terrace. The double-layered net spans between the two bedrooms with a pine tree peeking through in the middle. 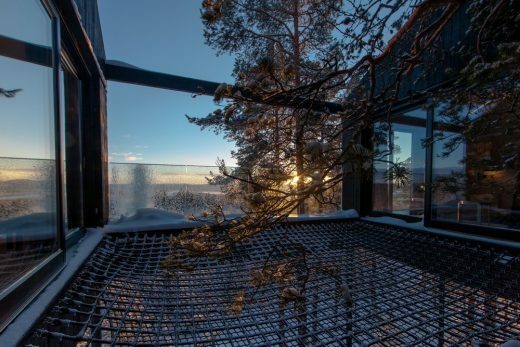 Extending the social space of the lounge, the net becomes a great opportunity for coming even closer to nature. For the brave ones, a sleeping bag is all you need to enjoy the night under the starry night sky. 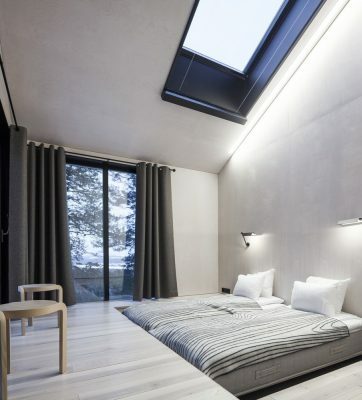 Guests sleeping inside can also look up at the night sky, with expansive, openable skylights in both bedrooms. 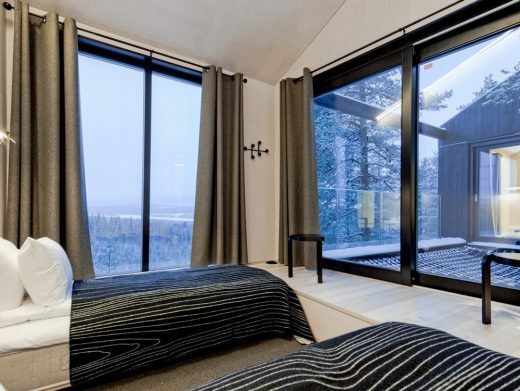 The bedrooms are located on opposite sides of the cabin, facing the central tree and net, with large sliding glass doors to enter out on the net. With large, generous windows in all rooms, natural light is the primary source of light in the cabin. Snøhetta has collaborated withlong-established lighting company Ateljé Lyktan, designing two different custom lamps for the 7th room; a bed lamp mounted to the bedroom walls and a suspended light for the lounge area. The lamps are made from birch veneer, reflecting the light in a warm tone on the inside, while the outside is surface treated black, picking up on the contrasting characteristics of the cabin. Piano hinges make it easy to adjust the amount of light being released from the lamps. The lamps thus create a flexible solution for the large variations in daylight throughout the year in the north. 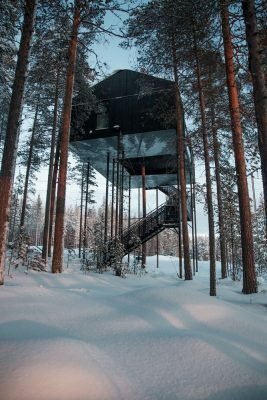 With its wooden characteristics and unique location in the treetops, the 7th room is a celebration of the Nordic cabin and the pine tree forest.